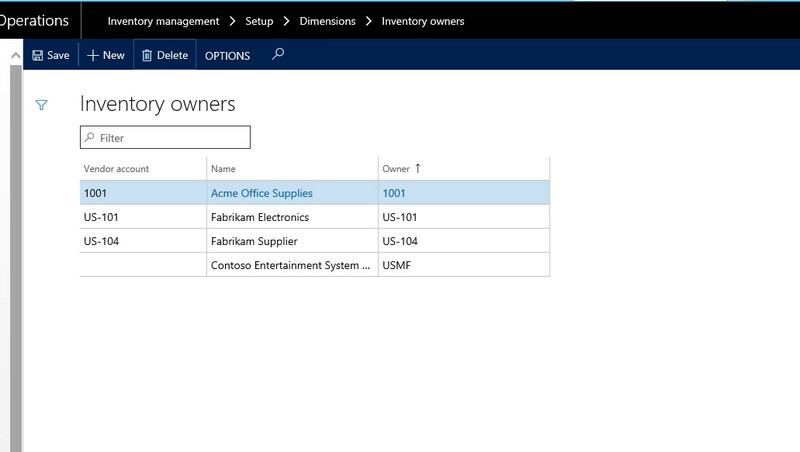 One of the gaping holes that has been painfully present in previous versions of the Dynamics 365 system on the supply chain management side is the ability to account for inventory that your company did not own. With supply chain becoming more lean, it can be considered a basic requirement to have access to materials when you need them, without tying up your financials, by acquiring them well in advance. It is part of this requirement that your fully integrated ERP system would support this – and now it does. This new functionality is geared towards inbound consignment and is really aimed at raw material consignment in a manufacturing environment. However, if your business is wholesale or retail, do not stop reading just yet! All this previous statement means is that there is more automation available during the handling of vendor owned materials at your location, if the material in question is a raw material and it is to be consumed into manufacturing. However, with the functionality it is fully capable and easy to implement for anyone. 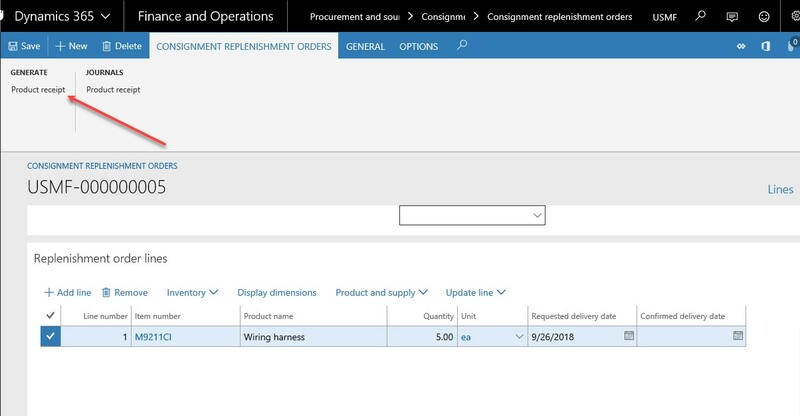 Now that I have you all excited, let’s jump into Dynamics 365 Finance and Operations and see what is available for inbound consignment inventory! The basis of the whole solution is a new tracking dimension called ‘Owner’. You must enable this dimension in the group for the products that will potentially be used in a consignment scenario. Create as many dimension groups with as many combinations as you need. To utilize this dimension, you need to create inventory owner entities – which is essentially just identifying the vendors that might own inventory stored at your site as a dimension value. You will have your own entity as the default owner. This is a new type of order particularly aimed at inventory that you want delivered to you without taking ownership. You may refer to it as a ‘light weight purchase order’ and that would be a very good description. The vendor selection is limited to those you have previously set up as inventory owners. 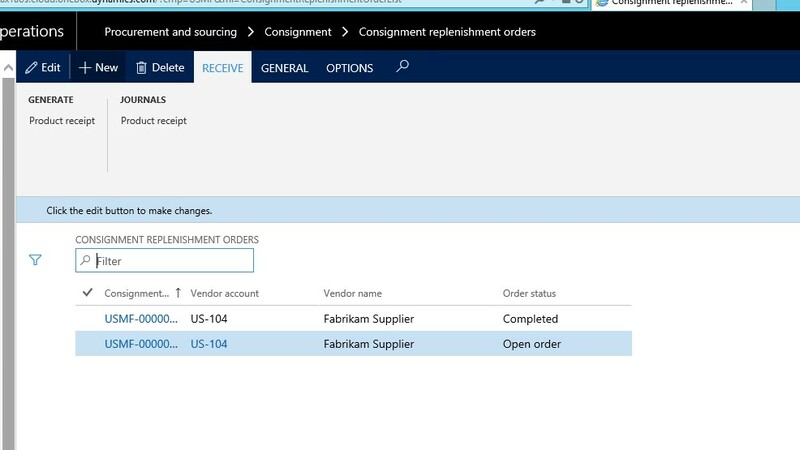 An inventory transaction of status ‘ordered’ is generated when the order line is saved, but the inventory owner is indicated as a dimension from the Consignment replenishment order. This allows MRP to take these transactions into consideration and not recommend double ordering. If your business uses the registration step in the receiving process, use arrival journals through the Arrival overview or simply use the registration form on the replenishment order. Proceed to receiving using either one of these options again – post the product receipt from the arrival journals through Arrival overview or directly from the Consignment replenishment order. When received, transaction status becomes ‘Purchased’ – not ‘Received’ as you would expect in the case of a standard purchase order. The transaction is in its final state now as there are no more steps involved in the consignment ordering and receiving process. It also allows better system performance, as this doesn’t leave open transactions for the system to process. In the process, the next step is triggered when you need the inventory your company consumes from the consignment stock and follows the agreed upon steps to report it to the vendor. The trigger could be a production order that generates a demand or simply a sales order. As you would in any other situation when a dimension value needs to change in inventory, you need a journal to switch inventory from one dimension value to the other for traceability. The new journal type is known as ‘Inventory Ownership Change Journal’. When this journal is posted, the ownership dimension value changes to your own entity, and inventory becomes ‘real’ with actual value. The PO is automatically created and received at the time of posting the journal. The steps involved in making the inventory ‘real’ are all automatic, therefore the purchase prices must be set up in the system for this to work seamlessly – the process follows the standard price engine logic so trade agreements or price entries on the release products work well with this process. If you are working in a manufacturing environment, you can auto-generate the lines of this journal based on your production orders that create demand. The functionality allows you to create production picking journals and place reservations on the component even if it is consignment inventory. The inventory must be turned into ‘owned’ inventory before the picking journal can be posted – and the ownership journal can be auto-generated as mentioned above. There is a hard-coded reservation rule that ensures owned inventory gets reserved before consignment-type inventory does. The functionality works well with the vendor collaboration feature. If vendor collaboration is enabled in your environment, the vendor user has an on-hand inventory look-up option and can be given access to create their own consignment replenishment orders. This way some of the overhead of the consignment administration can be passed to your vendor. You may also use some of the inventory journals in relation to consignment inventory, such as counting and adjustment journals to make sure inventory levels are reportable and adjustable if need be. You may also physically transfer consignment inventory with a transfer journal. One of the main limitations of the consignment feature however, is that it can only work with items that use non-periodic costing models – i.e. moving average or standard cost. It also does not work with advanced warehousing functionalities, so you have the option only to use WMSI if you would like to implement consignment inventory. I should note that transfer orders are also not supported within the consignment feature. The one limitation that is currently on Microsoft’s road map to resolve is to create a conversion process to enable items for consignment inventory that were previously not enabled. Contact us if you have any questions about Consignment Vendor Inventory!